LAS VEGAS— Flashy products and unique gadgets certainly seem nifty at a glance, but they don’t always deliver as promised. 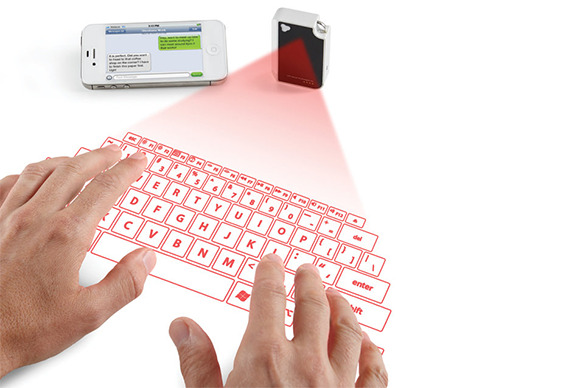 Take this CTX VK200 Keyfob Virtual Laser Keyboard, for example. This keyboard is supposed to provide the comforts of typing on a full-sized keyboard when packing one is difficult—it’s actually a small projector that can display a functional virtual keyboard onto any flat surface. This full-sized QWERTY keyboard projected in bright red onto a demo table caught my eye at CES on Tuesday, but when I went to try it out, I couldn’t successfully type. The device syncs with your smartphone or tablet via Bluetooth, but the Bluetooth connection wasn’t the problem. The battery life on both projector and the demo smartphone were fine. And when others typed, the text displayed on the screen without an issue. So, what was at fault? The $100 VK200 Keyfob is compatible with most mobile devices equipped with Bluetooth 2.1, and has a battery life that lasts for 120 minutes of continuous use. It recharges via USB 2.0.